Yes, animations are a bit out of scope, in part due to the flexibility / scope of detection. We've also tried some audio feedback, but the first iteration was so unsatisfying, we decided not to go with it this dev-branch release. There may yet be hope for it. It's also fair to say that we've not ruled out some more specific feedback (there definitely situations where some additional indication is appropriate, given the constraints of mouse and keyboard, etc.). In truth, we're only now at a point in development where we'd be implementing it anyway. We thought we'd stick in out on the wild, gather some feedback over a few days, and see how the 'au naturel' mechanic holds up on its own. We're all ears for your preferences / suggestions! Would it possible for you guys to add different feedback types in future dev branch version, so we player could decide whether audio or icon feedback is better? Right now, the positives outweigh the negatives in my opinion. The only thing to be potentially improved seems to be on the feedback side of things. + Works really well, I was unexpectedly surprised by small things like my knee being useful when appropriately couching, being unstabilized when aiming non-parallel to the ground in prone, etc. 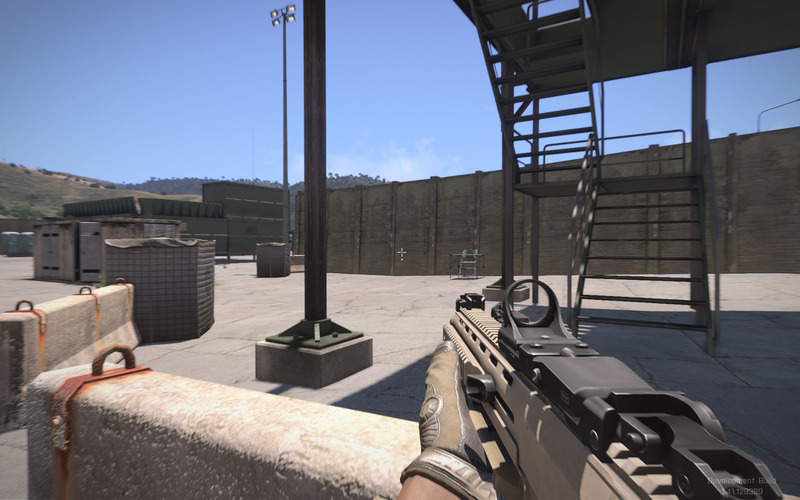 - Feedback to know when it's active or not when the crosshair is not present. I believe that this is more of a thing to get used to, rather than a really serious problem. We've been conditioned by mods to know exactly when it's on or off because it's not automatic and potentially unreliable. If this proves reliable enough to become second nature, it might not even need more feedback than the already existing one. Another thing that I'm not sure about is the "delay" while the resting goes into effect. This type of type of thing might "feel" better/more responsive if it was instant effect like the mods do it. In terms of know when one is rested, simply add it into the existing stance indication. When i'm crouched for example, and i slowly walk towards a wall, and it detects that i'm not resting my weapon on that wall, have some sort of addition to the existing crouch icon that symbolizes that i'm both crouched, and resting. Simple enough, right? Goes without saying for the rest of the stance icons. Bloody hell this is good. I love it. I've not found feedback necessary, personally. The weapon not swaying has been enough in the few tests I've managed this evening. However, generally, I would go for visual feedback. The most sensible thing would either be a slight alteration of the crosshair or a small icon below the weapon in the ammo counter. Arma is good because the UI is so unintrusive, and I found this resting mechanic to be really intuitive without adding more clutter. Will continue testing though, and maybe add a little more opinion later. Well, that's definitely not impossible, but at least in the short term, we'll likely let the feature 'settle in' for a few days before making any reactive changes. A day or two of experimentation seems potentially useful, though, and would make the most of the dev-branch update cycle, for sure. We'll have a chat and let you guys know! I've found couple objects that don't give weapon resting like you would expect and hopefully those can be fixed. Reporting those later. Automatic resting is too much like all these auto-cover third person shooters.. The little dot would appear at wherever the stablization comes from (in this case, under the rifle). If the crosshair is disabled, it could be displayed on the stance indicator (but that might already be cluttered enough so not sure). I find it very intuitive. Please no more GUI elements especially in the middle of the screen. Really like it, especially the recoil. Red Orchestra 2 comes to mind. Ok good to know. Though hopefully these could be fixed. At least the low rock walls make large portion of the map and the destroyed larger rock walls are also in every town multiple times. Here are the two kind of objects where weapon resting isn't working http://imgur.com/5Eyk0Zz,36VMpCs,EFm8Dne,97XURme#0 There's four pics in that album. Everywhere else it seems to work very well. The fact that I can find only those objects where it doesn't work is amazing already. What's the word I'm looking for... Flawless? I don't agree with those who say we need an indicator. The difference in recoil and sway is enough. Sway alone is hard without magnified optics, but with the difference in recoil added in, it's all good. The surface detection is very predictable. Another reason for not needing an indicator. What harm would an indicator do? There's no reason you couldn't turn it off if you want, and if weapon resting is truly as intuitive as some people are saying it is, there would be no disadvantage in doing so. What about people who don't use the crosshair? Yep after more testing the weapon resting actually works in my opinion so well that no indicator isn't even necessarily needed. It works where it should. As mentioned, a "weapon rested" indicator would be extremely beneficial. Weapon resting shouldn't be instantaneous. It should take a second or two to reap the benefit of it. Inertia should not be decreased. If anything it should be increased. Just like with a bipod, shooting from a rested position isn't as "flexible/non-restrictive" as shooting normally. Its a good system and works really well with the recoil as is. My main dislike is that its too easy and quick to use. It should be more accurate than shooting normally, but not faster. Right now it is both more accurate and faster. Make it take a moment or two set up, and inertia not nerfed by it and I think resting would be much more realistic. [*]Weapon resting shouldn't be instantaneous. It should take a second or two to reap the benefit of it. I don't think it is instantaneous. It seems to take a second or two to kick in for me. [*]Inertia should not be decreased. If anything it should be increased. Just like with a bipod, shooting from a rested position isn't as "flexible/non-restrictive" as shooting normally. After you move it takes a bit of time to kick in. But if you are crouched behind a wall, and than stand up so that your weapon rest on the wall, it will be instantaneously rested. I don't think that should happen. I really like the implementation. And even as someone who doesn't like HUD elements and stuff, I'd say that having a small, clear (visual?) indicator if the weapon is rested or not is necessary, though.